Just a quick update on my Ibis 928 wheelset since the review I posted back in January. Basically the wheels are as good as I described them back then. Stiff and light and they definitely liven up my hardtail. I’ve had about 250 miles of trail and road use on them (about 75% on trails) and they are as true and smooth rolling as the day I first put them on. My buddy I bought them from figures he had about 250 miles on them before me so they only have 500 miles so far and I wouldn’t expect to see any issues at this point anyway. My tubeless setup has worked fine – I have to air them up about every week but I’m an electronic-tire-pressure-gauge, get-it-within-1-psi-reading kind of tire geek. I typically run 23 psi front and 24 psi rear (I’m 170 lbs) and I find I’ll lose a couple of psi per week which is similar to my previous setup on Stan’s rims. The hubs are still smooth and aren’t showing any play. The only issue is a relatively minor one. The presta stems leak very slightly with the valve open. It seals fine after I screw in the valve. I don’t notice this on the stems that are on my Shimano and Stan’s wheels so it’s a bit annoying but just a niggle really. I’ll replace the valve cores at some point to see if that fixes it. And props to Ibis for supplying valve stems with removable cores – it costs them a bit more but it allows you to add sealant through the stem rather than popping a few inches of the bead of the tire from the rim to pour sealant in. So in summary, it’s been a good upgrade. I have recently seen that some sites are selling the 928 wheelsets for $999 which is really a bargain in the world of carbon wheels. The timing of this discount suggests Ibis is getting ready to release a new rim and the shops are clearing out inventory but that’s just a guess on my part. If you have $1000 burning a whole in your pocket this is probably the best upgrade you can make for that kind of money. On my commute here in Silicon Valley I see drivers run red lights every single day. And I’m only talking about the most blatant violations. You know, the light for the other street has turned green and the driver is just entering the intersection. When I look in the car, I often expect to see some kind of monster behind the wheel or an evil WW II fascist caricature. I mean – how uncaring and self-centered must one be to drive a 2 ton hunk of metal through a spot where pedestrians expect to safely cross just to save a minute or two on their commute? But no, almost everyone looks like a decent person. Men and women, aged progressives in their Priuses, the Mom with kids in car seats – they all do it. It isn’t getting any better so I wonder what the cities plan to do to alleviate this danger. In some areas they have increased the time before the other light turns green but this only seems to have encouraged the red light runners since they know they have a few extra seconds to enter the intersection. It makes me wonder why we don’t have red light cameras on a large scale. Have the car lobbyists won on this issue? Have they convinced the cities that the right of car drivers to run red lights is greater than the right of pedestrians to cross the road safely? As a cyclist, one of the most frustrating aspects of riding on the road is car drivers who literally save a few seconds and almost right hook me or pull out in front of me from a driveway rather than giving me a bit more time and space. The desire to get past the bike is so strong that they don’t think far enough ahead to realize that I will probably catch them at the next light anyway. In city traffic that frequently happens and I coast up next to the offending driver shaking my head and knowing that he/she will likely do it again given the chance. So it got me thinking – given the danger to me and the possibility I could get killed by a driver looking to save a few seconds – how much is a bonehead maneuver worth? Being an engineer, I can only think with a spreadsheet or similar tool so I came up with this one. I assumed the median salary for Santa Clara County at $93,500 and that the driver saved 5 seconds. I think you get the idea – the math is pretty easy. So when the high earner hits me that bumps my value up to 33 cents. I don’t know – I still think I’m worth more, but you can’t fight Economics. Maybe that explains why the penalties for hitting a person with a car are, in fact, so small. Brothers and Sisters…Use the Sharrow! Please ride right ON TOP of that Sharrow. Some of you know that you can ‘take the lane’ whenever you deem it safer than riding to the right side of the road. 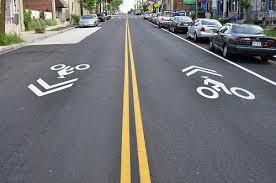 But that Sharrow you are riding around is the transportation engineer’s way of saying ‘This section of road is dangerous enough that we REALLY want you to take the lane’. So DO IT – please ride on that Sharrow. When you do it and I do it, the car drivers get it and give us the room we deserve.